Many Americans have never heard of dracunculiasis or more commonly, Guinea worm disease, a painful condition that is contracted when a person consumes water contaminated with water fleas carrying infective larvae. Dr. Ernesto Ruiz-Tiben, however, has had Guinea worm on his mind for the past 20 years. "Hopefully, this will be the first parasitic disease ever to be eradicated. If and when that happens, we will have done it without a drug and without a vaccine to treat or prevent the disease. If we can do that, it will be one of the greatest achievements in public health," Dr. Ruiz-Tiben said. As an epidemiologist with the Division of Parasitic Disease, at the Centers for Disease Control and Prevention (CDC), Dr. Ruiz-Tiben began working on Guinea worm disease and its eradication in 1981, when he was involved in the epidemiology and control of parasitic diseases. Retiring from 27 years of service as a commissioned officer with the U.S. Public Health Service and the CDC in 1991, he joined The Carter Center as technical director, Guinea Worm Eradication Program, in January 1992. 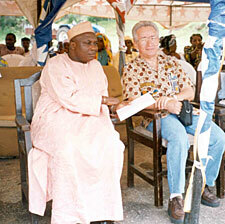 The Carter Center began its fight to eradicate Guinea worm disease in 1986. Today, the annual number of cases has decreased by more than 98 percent, from 3.5 million to fewer than 55,000 reported cases. There is no cure or vaccination for this parasitic disease, so the Center promotes reliance on other strategies to prevent transmission. By providing technical and financial support to national Guinea Worm Eradication Programs, The Carter Center works with its partners to train village-based health workers to detect the disease, prevent infected people from entering community water sources, teach locals how to use nylon filters to strain to all drinking water, and apply the larvicide Abate® to ponds and unprotected wells. At the beginning of his career, Dr. Ruiz-Tiben said he was not discouraged by the challenges the eradication program presented. "We never thought that we would fail," Dr. Ruiz-Tiben said. "One must admit that there are times that you think you will not overcome, but you continue to go forward and pretty soon you're over the hump and into a new episode with its own series of difficulties. We're getting close, and we're now a lot older and wiser than when we began, but the driving force is still there." Dr. Ruiz-Tiben said his first encounter with Guinea worm, in Ghana, opened his eyes to the severity of the disease and further inspired his eradication efforts. "I had seen many clinical pictures of the parasite, but you need to see the real faces of people, those behind the statistics, to truly sympathize with the misery that people suffer in remote, rural places. Yet we have all the knowledge necessary to eliminate it. That's the driving force for the eradication program -- to get this monkey off the backs of those who are the poorest among the poor," he said. As the Center's Guinea worm technical director, Dr. Ruiz-Tiben focuses his attention on the remaining endemic countries. People throughout the world are involved with the eradication campaign, and Dr. Ruiz-Tiben is responsible for communicating and monitoring their progress on a regular basis. He said awareness of the disease is important to further the global eradication effort. He therefore makes Guinea worm eradication data available to the public through publications, such as Guinea worm Wrap Up and scientific literature. Meetings with the Center's partners, such as the national programs, CDC, and the Peace Corps, strengthen the Guinea worm eradication campaign by keeping those who need to know informed about progress and challenges confronting the global campaign, he said. Dr. Ruiz-Tiben said,"We are always trying to understand clearly the problems confronting some of the national eradication programs and trying to find ways to circumvent those problems. Sometimes they're political, sometimes they're purely technical, sometimes financial, and we try to grapple with those and try to resolve them as best we can." His devotion to the Guinea worm program is time consuming, yet Dr. Ruiz-Tiben said that his family and colleagues inspire him to continue driving toward eradication. "My wife tells me all I do is think about Guinea worm. But the commitment and support from the people who lead the Center, like President Carter and Don Hopkins, and their dedication to the cause, is a driving force for all of us," he said. The biggest obstacle to Dr. Ruiz-Tiben's goal to eradicate Guinea worm disease in his lifetime is the civil war in Sudan, which has 75 percent of all remaining cases of Guinea worm disease. While the international community and the people of Sudan await a settlement of this protracted conflict, Dr. Ruiz-Tiben and his colleagues at The Carter Center are working hard to end Guinea worm disease in West Africa, the second most endemic region, and preparing for a final assault in Sudan. "The war and the absence of infrastructure in southern Sudan make it very difficult to organize a program in endemic villages," Dr. Ruiz-Tiben said. "We hope a peace agreement will come this year, and we pray that stability comes to the people of Sudan soon. They have suffered long enough from a disease that can be prevented." In addition to providing emotional support, Dr. Ruiz-Tiben's wife, Emilia C. Ruiz, celebrates his work artistically. For the past three years, she has made a Guinea worm quilt for an annual fundraiser and ski weekend the Carters hold for friends and donors of the Center (2003 quilt at left). The first quilt sold for $47,000, which helped support the Center's work. "The idea had come about because we had provided some funding to manufacture a cloth that could be used to identify village-based health workers working in the Guinea worm eradication program. There were so many interesting designs, and my wife had become fond of the art of quilting, so it just occurred to us to do a quilt using Guinea worm country cloths," Dr. Ruiz-Tiben said. 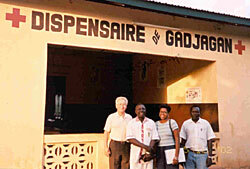 Ernesto Ruiz-Tiben (l.) joins colleagues Amegbo, Azalia, and Joseph outside an African clinic. 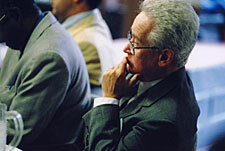 Read more about Ernesto Ruiz-Tiben (above), technical director of the Carter Center's Guinea Worm Eradication Program.